"Best entry level computer sewing machine with the most features for the money! The only one with Extension Work Table, Hard Cover, Walking Foot, Quilt Guide, AND Darning Embroidery Foot" John Douthat, Owner & Tech, AllBrands. AllBrands is a Brother Authorized Dealer and ASC Authorized Service Center for any repairs including warranty parts and labor. We give unlimited technical support by email, fax and phone. We service machines in our stores and/or refer to nearest ASC centers nationwide. Mass merchants do not have tech service or repair departments for your equipment. They are unable to help you directly, only referring any operational, mechanical or electronic questions back to the manufacturer instead of taking care of problems themselves. Manufacturers and customers should expect that any problems will be taken care of by the dealer or merchant who sold you the equipment, not just by referring your requests back to the manufacturer. Sew Advanced and Sew Portable! 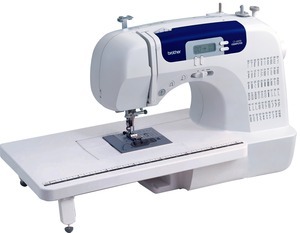 The CS6000i computerized sewing machine includes 100 stitch functions, 60 built-in stitches, 7 styles of one-step, auto-size buttonholes, one-step bobbin replacement with quick set drop-in bobbin and automatic needle threading. Bonus accessories include an oversized table for large sewing and quilting projects. A LED display with computerized stitch selection will make creating delicate family treasures a breeze using the built-in heirloom stitches. Start stop button built in, Operate the machine with or without the foot control. This light weight computerized sewing machine is heavy on the features that you are looking for! The CS-6000i has 60 built in stitches including, utility, decorative, heirloom, quilting and 7 styles of one step auto-sizing buttonholes. Whether you sew for crafting, garment, home decoration, or quilting; this machine has it all for you at an affordable price! The CS-6000i also includes a plastic fitted wide table to support your larger projects such as quilts. Machine Dimensions (H x W x D): 11.4" x 6.7" x 16.1"
Shipping Dimensions (H x W x D): 15.0" x 9.9" x 19.49"
free motion quilting foot was optional. However they are now included for a total of 11 presser feet. On the Machine: Hard Shell Cover, Regular Straight Stitch Zigzag Foot. AWESOME customer service both online and in stores. Ordered this at 4pm, had delivered to my door the next day around lunch!!! I've been in both Lafayette and Baton Rouge stores and have been very pleased!!! i have ordered several items from AllBrands over the years. I am always impressed at how quickly I receive my order. Thanks! I am a beginner sewer and quilter, and so far - so good. Thank you. All Brand was highly recommended to me by a friend who has bought / ordered serveral machines from you. The product and the shipping was excellent... The service and communication with everyone was also excellent.. I cant complain at all. And I could also say my mother enjoy's it.. I even had it before Mother's Day and It was in perfect/excellect condition. Hi, I was looking for a moderately sophisticated first sewing machine for my 14 year old daughter, who has been sewing on my machines for 3 years now. This machine we purchased, computerized Brother CS6000, fit the bill. My daughter is delighted with the decorative stitches, the variety of stitching options from woven to stretch, loves the smooth operation of the machine, curvy Hobbit-like shape, light weight, sewing light, quilting accessories, and last but not least the tinkling bell sound. The stitches I've seen so far are even and neat. Because of it's versatility I think this will be a good machine for her to experiment with in all the different styles and fabrics she likes to try out. Best of all it was a birthday present, I ordered it early in the week, never expecting it to arrive by Friday, the day of her birthday, but sure enough it did arrive! Thank you, for your prompt shipping. Great quality sewing machine for a great price. Fast delivery and it was easy enough to maneuver through the checkout. Overall a good first experience. Brother Demo XR9500PRW Project Runway Computer Sewing Machine for Pick Up Only from AllBrands Retail Stores.